Ever heard of one of these? Well it’s a modern version of swapping some seeds with your neighbour over the garden fence. 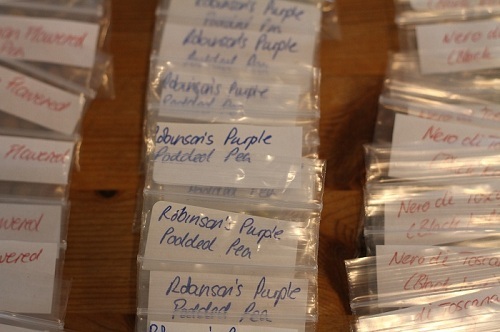 Basically you and a few friends, a community group, fellow allotment holders, gardeners, or even internet friends and forums get together and agree to grow and save seeds to swap within the group. It doesn’t have to be complicated, you don’t have to grow amazingly unusual crops, just basic down-to-earth flowers and vegetables. Each person in the group chooses and grows 2 or more open pollinated / heritage / landrace varieties for seed saving. You need to grow and harvest enough seeds to share within the group – something like 6 to 12 beans each, maybe 6 pepper seeds or 8 peas, a pinch of lettuce seeds or a teaspoon of kale. And once you have harvested your seeds, you need to bag them up and distribute them among the group. Some groups have 1 person who acts as a distribution point, and collects the individual seed packets together and then sends them on to the members. While others might meet up over a cup of tea or something stronger and swap their seeds. Did I mention how inspired I think this is? I’ve been saving seeds for a couple of years now, prior to that I’d never tried; I went in pretty blind, but oh boy did I learn lots! And yes there have been a few no-shows, some disappointments along the way, but there have been some remarkable successes too. And I’ve learnt so much about how seeds grow and develop and then how to harvest and store the seeds. And all throughout this I’ve been able to try new varieties of vegetables that I hadn’t heard of before or hadn’t thought of to try. 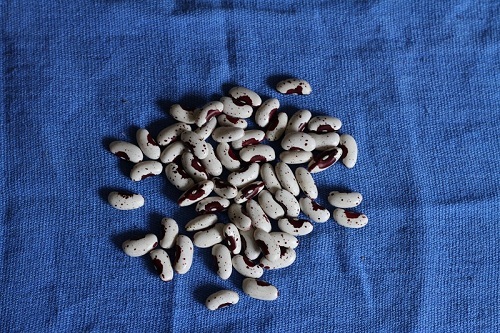 And that’s the best bit – I get to grow lots of different varieties, many of them heritage, and then obviously eat them. It’s no use growing something and saving seeds if you don’t actually like it. And yes some vegetables do better than others. But who knows you may find a firm family favourite that you simply HAVE to grow every year. So by creating or joining a seed saving circle you get to pass on knowledge, experience, plus rare varieties that the major companies don’t produce, oh and seeds! And lastly – there is little or no cost involved. A few seeds, some land or pots, some envelopes to store the seeds (you can always make your own), and a stamp or a cup of tea. With all this seed swapping and saving I started to write my own notes up, there are a few good books out there and some detailed information on the web, but I’m not a biologist so a lot of the science can get lost on me. If you fancy trying to save a few seeds next year, have a look here. There are some basic Do’s and Don’t’s, but it is reasonably simple and logical – besides if I can manage it, anyone can! I’ve just bagged up and sent my parcels off, I hope that my seeds will be a success, but I have to admit I’m excited to see what I receive in return!. This is my 200th post, who’d have thought I’d have so much to write about?! And to celebrate I thought I’d return to what I love – gardening. What a fantastic idea! Happy 200th post too – I think a post on what you love is perfect! Kudos on your 200th post! I want to be around for the NEXT 200! I’m with you all the way. I get lulled into thinking I’ve got a bargin of 1000 seeds for 1.99, but then I will NEVER use all those 1000 ! Oh Celia, yes to being closer! I’m a member of an online swap in the UK / Europe, I’m sure there are some in the US, or even in your state? I’ve been seeing more mention of these seed circles (not to be confused with crop circles! 🙂 ) in various forums lately–my interest is definately piqued! Such a great, inexpensive way to try out new plants! What a great idea! I don’t care how tasty the tomatoes are or how inexpensive the seed, I don’t need 30 seeds in one packet. Your “circle” idea is a far better approach than getting seeds via some online catalog house. And congrats on number 200!!!! Hi John, good to have you along in spirit 🙂 the more the merrier and seedier! Congratulations for the 200th post! The seed saving circle is an amazing idea. If I only had a garden I would certainly participate. Hi Sissi, and thank you 🙂 Its a lot of fun to do ! 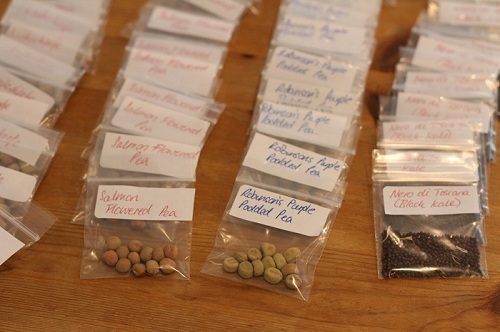 Seed swapping….I never thought of that, but it sounds lots healthier than a cookie exchange. When I am in Maine, I do have a small, very small, garden, some of which is started from seeds. Swapping and trying something new could be fun. Lulu you are so right about it being healthier than a cookie swap – but a cookie swap sounds delicious ! I think this is such a neat idea. Have you done any previous posts on seed saving? I want to try this but have no idea where to start. 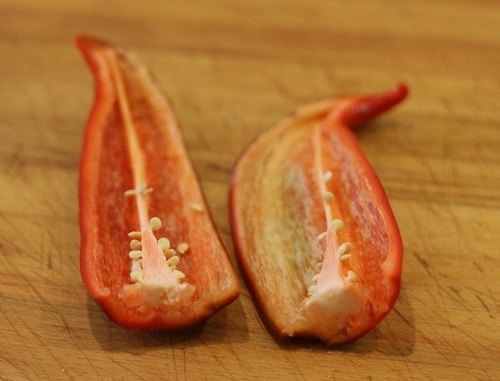 Hi Julie, yes I have I’ll go and add some links on the bottom of the page, things like tomatoes and peppers are good fun and an easy way to start saving seeds 🙂 And thanks for the interest! I love this! I really would like to start this with a few garden friends! That would be wonderful 🙂 It could simply be swapping your extras or growing some extras to share. Good luck ! What an inspired idea. I have never tried saving seeds before, but this fall I retrieved a whole bunch of seeds from my hostas and will be attempting to start them in January. Since who knows their heritage not quite sure what I’ll get (if anything, knock wood) but I have my fingers crossed. Happy 200th (a little belated)! I’m switching to heirlooms this coming spring, and I am really excited about adding a new dimension to my gardening with seed saving and sharing! I love the beans pic, btw. I love growing heirlooms, they often have such amazing flavour, and the bonus is that you can save their seeds 🙂 and thanks for the compliments about the photo ! Send some seeds my wayyyy. You inspire me to no extent!! I love your space. Keep going! Just awesome and very inspirational. Hope to find some seed swapping buddies close to me. My father was a farmer in the former Yugoslavia and when we came to Canada he would always ask friends and acquaintances for cuttings or seeds from their plants. 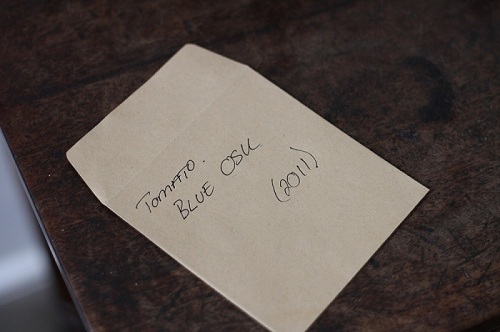 He also saved the seeds from his finest produce, wrapped them up and labelled them in a way that only he could decipher. When he passed away last year and I was emptying out the basement of all the junk, I ran across a biscuit tin full of little packages of seeds that he had saved. I kept it as a keepsake of a wonderful father. A fabulous story there, it’s how so many of the old varieties have kept going. Maybe you could try germinating a few of the seeds, you might get some results. And congrats on saving the Basil seeds, the Thai one is a favourite of mine (it’s also tricky to find in the shops). The trouble is I can never seem to grow enough of it! And, I’ll try sprouting some of my dad’s seeds. Thank you for the suggestion. I’ve used the Thai basil in a soy, chilli an dbasil dish which I add prawns and some vegetables to, it’s a nice aromatic dish. Good luck with the seeds, some will be better than others, if in doubt try a few on some damp kitchen paper, in a warm spot to see if they start to derminate. It could be fun to see what you get!